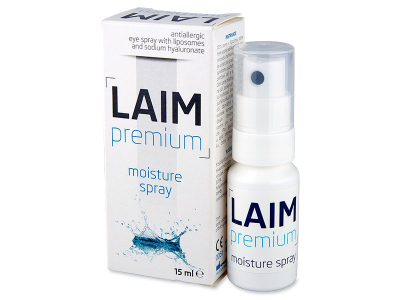 Laim Moisture Eye Spray stabilises the lipid layer of the tear film, enhances eye and eyelid lubrication and ensures comfort for users of soft hydrogels and silicone hydrogels. The product is suitable for all contact lens wearers, but it is also used for the treatment of dry eye symptoms caused by screen use and environmental factors. Its formula contains an outstanding wetting agent, sodium hyaluronate, and it is scented with chamomile extract. 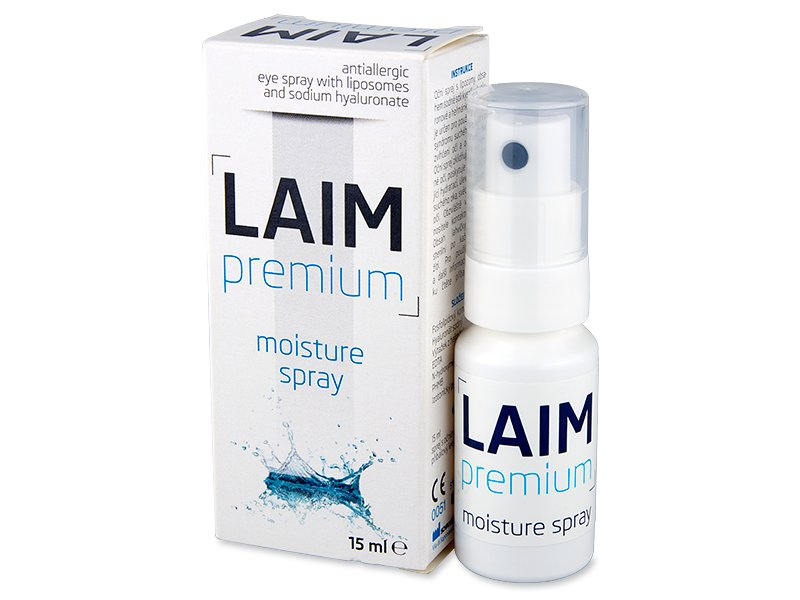 Laim Moisture Eye Spray is sprayed on the closed eyelid from a distance of 10 cm. Thanks to a modern technology relying on the transportability of liposomes, the active ingredients of Laim Moisture Eye Spray penetrate to the eye through the closed eyelid. Thanks to a breakthrough atomiser with antibacterial filter, the product can be used until the expiry date no matter when it was opened. 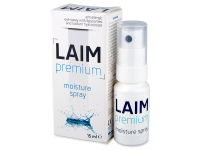 Laim Moisture Eye Spray lasts 3.5× as long as similar products of competitors. If you do not use eye drops regularly, you no longer have to dispose of almost full eye drop bottles only because they have been open for several weeks. This product is suitable for use with all types of soft contact lenses. Discover our other high-quality eye drops and sprays here. Brought this along on a skiing holiday, and it was just brilliant. Didn't realize how dry my eyes were getting in the mountains, but this spray works great. Great spray, i was skeptical at first, but it truly works just as well as regular drops. Tried this spray on a whim, and have been highly pleased with the results. My eyes are incredibly dry this time of year, and it seems to work wonders. I'd recommend it to anyone. Great for when driving long distances. My eyes don't get so tired now. I recommend this product highly. Very good product. My eyes tend to get quite dry in the winter, so I expect this will help in the coming months. Unique product. Very helpful for dry eyes. Thank you for the quick dispatch and delivery. Really innovative concept. I dislike regular drops, so this has been a lifesaver. A lifesaver for anyone who works in an air conditioned space. Between the AC and staring at the computer screen, this spray is a welcome relief. I'm a graphic designer, and this helps during long hours at the computer screen. Highly recommend it for anyone who has to work on a computer for many hours each day. I'm not a contact lens-wearer myself, but I borrowed this spray from my husband, and now he's had to order a new one for himself :) Excellent product, better than any drops I've ever used. This spray is brilliant and the first thing I packed for my holiday. It's an absolute must-have for warm summer days. I'll never go back to eye drops. This wonderful spray is endlessly convenient, even on the go, in public. Awesome product. Does the job, and doesn't make a mess of my eye makeup. I can highly recommend this. What an interesting concept! The spray is quite refreshing and works just as well as normal eye drops. Very pleasant and refreshing feeling. Thank you for the advice and great communication.